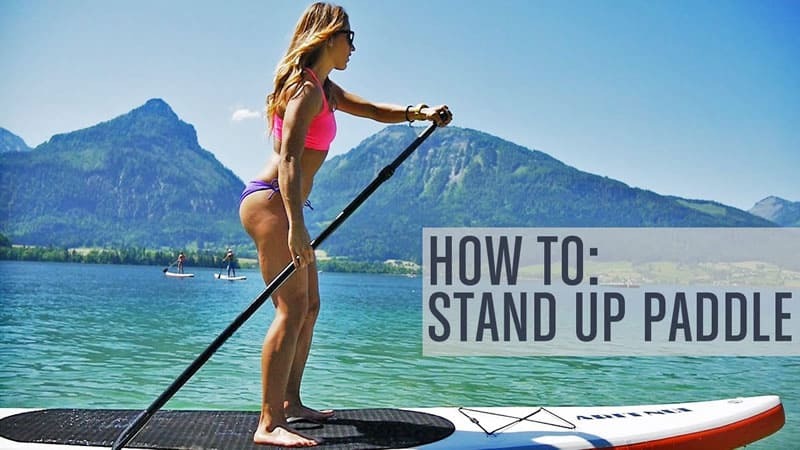 Stand up paddle boarding (SUP) isn’t a simple task at first. It’s easy to look at an expert and wonder how they make it look so easy. As with a lot of water sports though, it’s best just to throw yourself in at the deep end and don’t worry about embarrassing yourself. If you get out there with these trusted methods, then very soon you’ll be paddling along with assurance and confidence, and having great fun in the process. 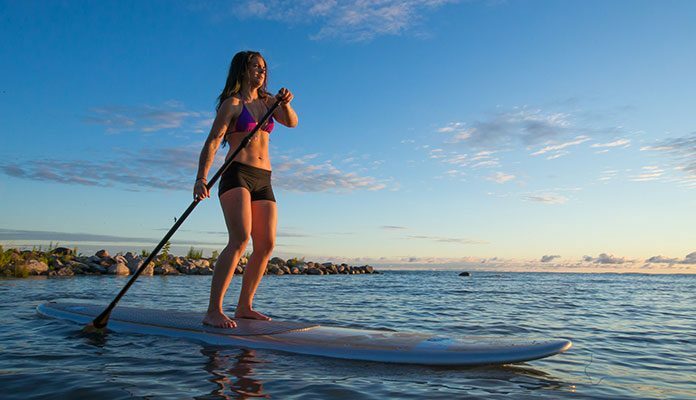 First things first before you paddle a SUP board are selecting the right paddle board for you. While you may want to jump right in and choose a narrow paddle board which offers quicker turns and faster speeds, it could put you off altogether if this proves to be too difficult. Sticking with a wider board at the start will give a solid base from which to start paddling. When it comes to standing on the paddle board, it’s always best to start out in the calmest waters possible. If you’re in cold water then make sure that you’re suitably dressed and wear a wetsuit if needed. So as soon as your board is in water deep enough to cover your fin, climb onto the board with your knees first and then take a few strokes to get into the deeper water. Slowly stand one foot at a time with your feet being parallel to the stringer and make sure they are roughly shoulder width apart. You’ll want to have a slight bend in your knee and to keep your core at the center of the board. 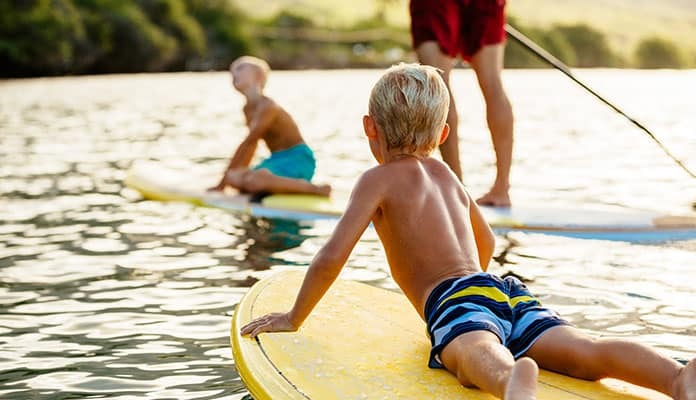 In terms of how to hold a paddle board paddle, you’ll want to make sure that you place one hand on the top of the paddle and the other in the center of it. The paddle should be held in front of you with your elbows roughly sitting at a 90 degree angle. If you look at your blade it will be angled, and you’ll want to ensure that this blade angle is always facing away from you. If you lose your balance or drop your paddle for another reason, then there’s no need to panic, the paddle will float so it will be very easy to retrieve. With selecting the right length of paddle, when stood up it should reach your wrist when you have your hand straight up in the air above your head. There are fixed length paddles or adjustable ones, but make sure you’re using the right size for you. The forward stroke is the one you’ll be using the most and it’s fairly easy to master. The hand on top of the paddle will be acting as a lever which will pivot around the base which will be your hand on the middle of the paddle. For the forward stroke, push the paddle out forward with your top hand and rotate your shoulder forward to extend your reach, your other hand should remain stable. Place the blade of the paddle fully into the water and use your top hand to push the paddle through the water, while pulling back with both of your arms almost straight. There isn’t a perfect amount of strokes that you need to do on each side to keep the board straight, but around four should be fine. This is essentially the same technique as the forward stroke, just the other way around. This stroke is mainly used for slowing down or stopping your board, but it can also be used for sharp turns when required. As with the forward stroke you should aim to keep your arms as straight as possible and pull the paddle back to the center of the board. If you want to turn then completing a reverse stoke on the right of the board will pull it to the right and the opposite for the left side. The final basic stroke is the sweep stroke which is used to turn your board. While consistently using the forward stroke on one side of the board will give you a gradual turn, a sweep stroke provides a sharper turn. You’ll want to have a larger stroke than usual so you’ll one to bend a little more and lower your arms. The stroke is from the nose to the tail in a long arc shape. This will turn your board to the left side if you’re paddling in the right, and to the right if on your left. As a beginner it’s easy to make simple mistakes which can make your life harder, or lead to injury. One such mistake is hunching over while you’re on the board. You should keep your back straight at all times. Another common mistake is standing on the board as if it was a surfboard; this isn’t an effective way of paddling at all. You need to make sure you stay straight with your feet parallel to the board. One error that will really hurt your enjoyment would be placing both of your hands on the shaft to the paddle. This would create a large strain on your arms; make sure you have the correct grip at all times. Make sure too that just all of the blade is fully in the water. Too far and you add unwanted strain, not enough and you’ll generate no power. Also make sure your knees are slightly bent at all times to keep your balance. Learning anything can be tough, and when you’re out there on the open water, there’s nowhere to hide. SUP boarding is a lot of fun, and it won’t be long until you’re mastering the art and having a great time. So if you fall off or lose your paddle, just start again and remember those basics. Try and be as confident as possible and don’t worry too much about your balance. Before you know it you’re be paddling a slim board and teaching the next enthusiast how to do it.